Bren Flanigan, World Ambassador Bren Flanigan ’16 shares his economic skills and American culture as a Peace Corps volunteer. 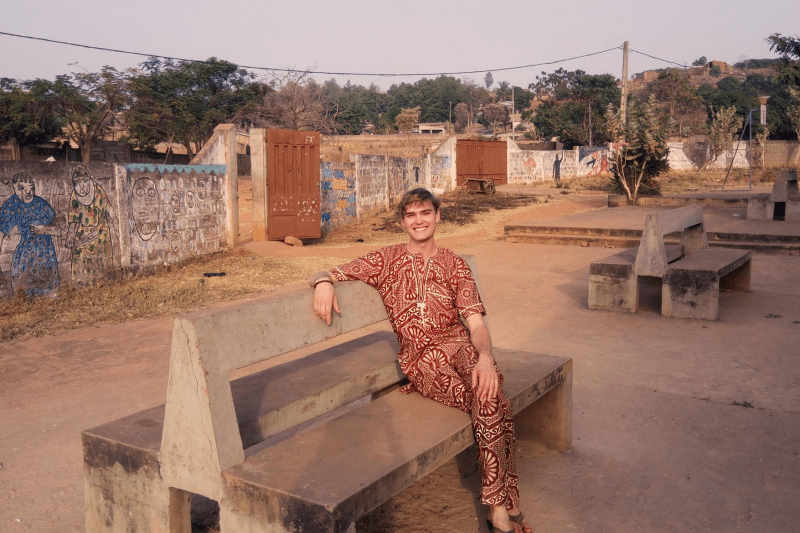 Bren Flanigan ’16 at Maison des Jeunes (House of Youth) Park in Natitingou wearing an outfit made of traditional Beninese fabric. The night Bren Flanigan ’16 woke up with a mouse on his neck is one he won’t soon forget. 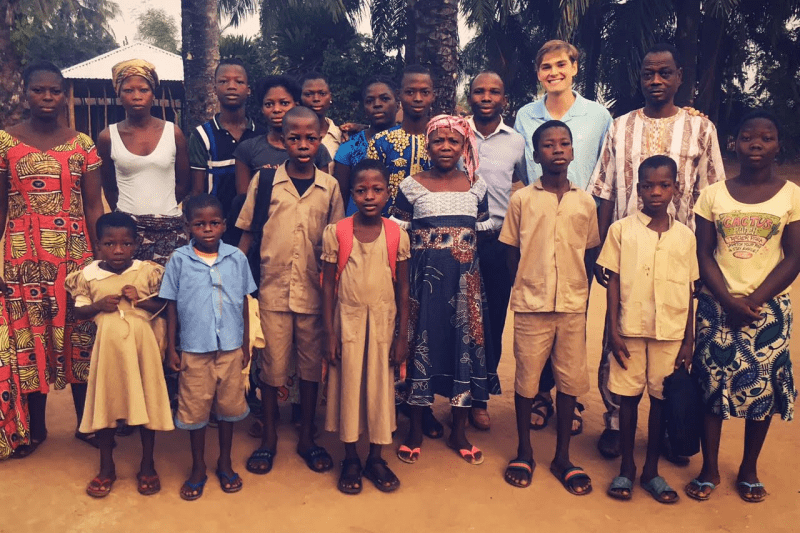 As a new Peace Corps volunteer assigned as a community economic advisor to Benin, Flanigan became immersed in the French language and Beninese culture by living the first three months with a family in a small village of 1,000 people. He became very attached to his large host family — a husband, four wives and 20 children. They felt the same about him, and have kept in touch since he moved to his permanent, two-year assignment in Natitingou, the largest city in northern Benin. Flanigan asked for an urban assignment, partly to counter the usual impression of Africa as just villages — a concept he learned more about in a W&L class, Africa and the Western imagination. Unlike the host family’s village, which had a pump for water, little electricity and no toilet, his city life includes ATMs, toilets, restaurants, running water and electricity. His goals as a Peace Corps volunteer are to share information about American culture and life with the Beninese people; to share his economic and technical skills as a volunteer; and to share Beninese culture with friends, family and others back in the United States. In Natitingou, Flanigan works with three organizations that are overseen by the same person. An international non-governmental organization promotes use of the Western African cereal grain fonio. Native to the region, it can be transformed into a powder and is used in popular local dishes to combat malnutrition. The five staff members work with 200 fonio producers in 10 villages. A connected business focuses on marketing and selling fonio. Since everyone has a smart phone, part of the marketing involves social media and apps. As Flanigan becomes acclimated to the business’ processes, he will advise them on accounting practices. The third organization is an orphanage for teens ages 18-19. About 30 are housed in a nearby building. Flanigan plans to organize an English club for them, since all students in Benin study English. He also wants to use his Peace Corps skills to teach them how to start businesses. Bren Flanigan ’16 with his host family. Flanigan is no newcomer to international travel. Encouraged by his parents, he has visited 24 countries since 2006. He has lived on three continents and studied abroad twice. In 2014, he spent the summer working at the U.S. Embassy in Lusaka, Zambia. Even in the U.S., his recent summers have focused on international relations: In 2015, he worked for the U.S. Agency for International Development in Washington, D.C., and in 2016, he spent the summer working for the Department of Public Information at the United Nations in New York City. “I became totally immersed in international relations and learned how aid diplomacy works at the highest levels of government during those assignments,” he said. At the U.N., he gave a speech before the U.N. ambassadors from Mexico, Greece and Portugal and about 45 other diplomats. He spoke about combating xenophobia and empowering youth to support the protection of refugees. Flanigan came to Washington and Lee from Carthage, Missouri, primarily because he knew of the university’s outstanding reputation in liberal arts. He continues to be proud of his choice and takes everything he learned with him around the world. “W&L really makes each student an excellent ambassador of American culture. We can talk about almost anything given our liberal arts background, and our campus environment instills in us an adaptability and ambition that we can use to go anywhere in the world and share our skills and knowledge,” he said. Some classes and professors stand out for Flanigan. Seth Cantey’s capstone course in Middle Eastern politics “changed my thinking process about how to interpret conflicts and diplomatic challenges to the U.S.” He said the course looked at where conflicts originated and how they influence culture today. Looking at war and peace through an economic lens was the focus of a course taught by Shikha Silwal, assistant professor of economics. Flanigan said understanding the topic can help governments make more informed policy decisions. Outside of class, Flanigan was assistant head hearing advisor, helping students accused of honor violations to present their cases, and supervising other hearing advisors. He served as president of the Student Recruitment Committee and gave tours to prospective students and Johnson Scholar finalists. He also was a member of Phi Gamma Delta fraternity.